i am usually very skeptical when actors turn up at events head to toe in a particular look straight off the runway. 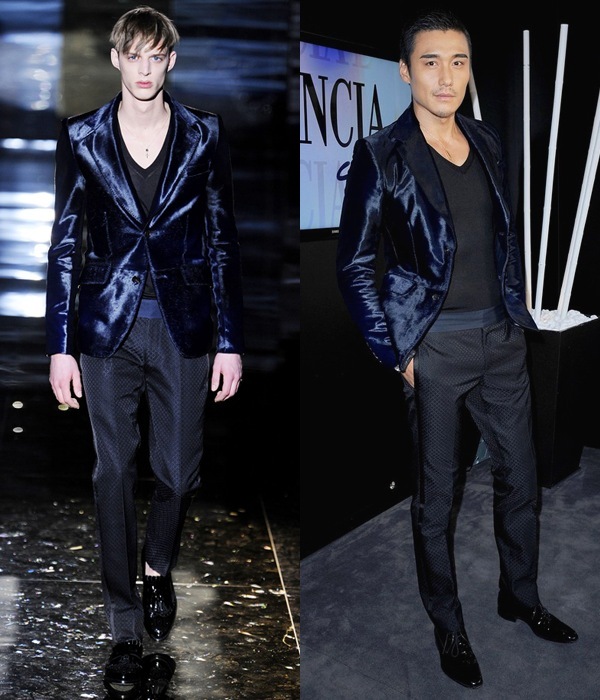 chinese actor hu bing arrived at the 'la dolce vita' cocktail party in rome, dressed head to toe in look number 39 from gucci fall winter 2010. but i am pleasantly surprised, i think he looks really good. i'm sure being an ex-model and towering at 1.89m (stalker who?) definitely helps. he even have no qualms wearing that partially see-through top, which i think it's a major no-no for most guys, but hey if you are 38 years old and you still have it, flaunt it. hu bing is in rome to contend for the 'best leading actor' award for his film "bei mian" (the back). what i really like about this look, is the trousers. i love the diamond-print fabric, and even more so the cutting and length of the trousers. when most celebs borrow outfits the most disappointing part is usually the length, most just doesn't hem it properly. i honestly think hu bing carried off the look better than the runway model. i'm not crazy over the jacket, which i can't quite make out if it's metallic or velvet, but overall good look, he doesn't look overly styled or uncomfortable. i really like the trousers, i think it's very flattering. i want a pair too. with china soon poised to be the biggest consumer of luxury goods, i think this is a very good effort of marketing a collection to the far east. there's no need for dragons and tigers motifs, and hu bing looked equally nice. The saying holds true. You can't buy style, even if its straight off from the runway. I don't know why some people do a straight replica of outfits they've seen in the catwalk and wear head to toe the same designer. Runway does not always lend well to street wear. People should mix and max. That's the beauty of fashion. You loose that when you wear something straight of the runway without putting your own individuality to it. Fashion should always be individualized not copied. i love his eyebrows. . . the clothes are nice too. The Far East has a lot of developing still to do. Growth in GDP means nothing human progress wise. It just means you have more money, money the big designing houses are happily to exploit. It’s sad to see one of the most populated country (China) in being turned into luxury chasing consumers. Things we in the West despise now. Greed is bad. We know this from experience now. Happiness and bliss is better obtained through other means than consuming. You really can’t fight the strong hand of the market. To turn the tide and turn Chinese people from a nation of savers to a nation of spenders. I see a lot of repeated mistakes we made here in the West replicated in China by corrupt corporations who are willing to do anything to make profit. louis: i usually do not like people stepping out in the complete look from the runway, but i honestly do think hu bing looks good. imagine you've not seen the runway pic and judge his look by itself, i think he looks cool. feng: i fear we are getting a little political here. closing off china to the western market will only lead them back to the communist era. exposing them to western influences only encourages choices. maybe it will take the next generation, but with choices people make informed decisions. I wasn't being political. Just observing what's happening. I was talking about consumerism. I never thought that talking about consumerism would make one political, I guess when one discusses China it somehow becomes political. I'm from North America and I was speaking from experience. We have so many choices here. Often times through media, advertising and television, not to mention magazines and the internet, the choice of what we buy is already made for us. Like I learned from watching Devil Wears Prada yesterday,we consumers have so little power in the choice we make when it comes to buying, even if one is not fashionable or rich. I'm sorry never met to make you feel bad as I just realized you do promote consumerism with your blog which I love and I find a tad bit of a guilty pleasure. I will admit he looks cool. There is this other lady, I don't know her name I think she is the fashion editor or creative director of Vogue Nippon ( Japan- Nippon is another word for Japanese I just learned) and she always steps out in complete straight of the runway attire. I find it so weird. The fun part of fashion is mixing designers and mixing high end with low end. louis: i believe you were referring to anna della russo. she has a huge following. with womenswear it's a different ball game. I think the sweater is one of those that you don't realize it's see-through until it's hit with flash. Though he's fit so it's not a problem. I'm a sucker for shiny suits, so I love the jacket and the trousers (minus the tuxedo stripe on the sides). Sorry but he doesn't quite work the outfit as well as the runway model and I feel it's not as flattering on him that it should be (perhaps it's the fit). First...is Hu Bing 38 now??! OMG... I remember seeing his editorial shots when I was little, wow, he is official antique now and time has definitely brought him grace.